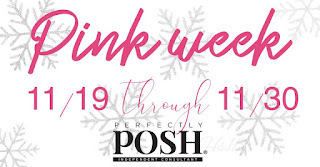 Pink 'n Posh: PINK WEEK is here! You've heard of Black Friday, Cyber Monday, even Small Business Saturday....but do you know about Pink Week? At Posh, we don't limit ourselves to one day - you get a FULL WEEK (and then some!) of great deals that include free gifts with purchase, buy one get one FREE deals, brand new products being launched, and much more! If you don't already follow me on Facebook or Instagram, now is the perfect time to do so! Deals and freebies will be posted daily, along with brand new products, and a few surprises, too!